1. Heat half the butter in a large frying pan and cook the leeks for 5 minutes until softened. 2. Meanwhile, cook the pasta in a large pan of boiling water according to packet instructions. 3. Tip the leeks into a large bowl. Add the remaining butter to the pan and cook the mushrooms and garlic for 5 minutes until golden. 4. Drain the pasta and return to the pan. 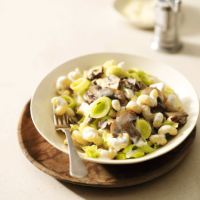 Stir in the softened leeks, garlic mushrooms, mascarpone, chives and cheese. Toss together well, then divide between bowls and serve with a good grinding of black pepper. Macaroni or rigati pasta would also work well in this recipe as the creamy sauce will generously fill the hollow tube shapes.